Last revised 15 August 2011. Journal Text: 112:58:42 to 113:02:14. QuickTime Clip: (3 minutes 32 seconds); (4.8 MB). Apollo 17—Taurus-Littrow—December 11, 1972. 16mm landing film by Gary Neff. The last 3½ minutes of the sixth and final manned lunar landing filmed by the 16mm data acquisition camera through lunar module pilot Jack Schmitt's right-hand window. The video begins at an altitude of about 12,500 feet and continues until just after touchdown. Gary also has provided an orientation tutorial. The initial view is of mountains and a section of the valley floor. More of the valley is revealed as the lunar module pitches forward slowly. Pitchover proper occurs at 37 seconds with the window now directed more towards the cratered valley floor, and more mountains appear on the right. Cernan identifies Camelot crater. Notice after time 1:40, as they descend through 1,000 feet altitude, how the LM shadow appears as a black dot on the surface and grows clearer below 800 feet, beside the left frame of the window, just above the centre. It passes out of view at 1:55 as they go through 500 feet. Blowing dust becomes noticeable at about 2:45 or 70 feet altitude. The landing probe shadow begins appearing at the top left of the window at time 2:56, or 40 feet. On touchdown, the LM settles backwards and, only 5 seconds after Schmitt announces engine shutoff, the dust also settles to reveal the surface. Journal Text: 118:14:22 3 minutes 35 seconds ( RealVideo Clip: 0.9 Mb or MPG Video Clip: 32 Mb ). Both clips by Ken Glover. Journal Text: 118:17:35 3 minutes 10 seconds ( RealVideo Clip: 0.8 Mb or MPG Video Clip: 28 Mb ). Both clips by Ken Glover. Journal Text: 118:20:35 4 minutes 33 seconds ( RealVideo Clip: 1.1 Mb or MPG Video Clip: 40 Mb ). Both clips by Ken Glover. Journal Text: 118:21:26 QuickTime Clip: (2 minutes 7 seconds; 1.5 MB) by Peter Dayton. Raising the flag: At the beginning, Jack Schmitt is closer to the camera than Gene Cernan. Gene hammers the bottom half of the flagstaff into the ground then inserts the top half, with flag attached, into the bottom half. The flag appears to wave as he moves it about. Jack moves away to take Gene's picture beside the flag. Journal Text: 118:23:36 QuickTime Clip: (1 MB) by Peter Dayton. Jack completes taking pictures of Gene beside the flag and they change positions to allow Gene to photograph Jack with the flag. Jack makes a short speech saying that the flag has flown in the Mission Operations Control Room (MOCR) in Houston since Apollo 11, and he thanks all those who have worked so hard to put them on the moon. CapCom Bob Parker replies by thanking him on behalf of the MOCR workers. Journal Text: 118:24:51 3 minutes 04 seconds ( RealVideo Clip: 0.8 Mb or MPG Video Clip: 27 Mb ). Both clips by Ken Glover. Journal Text: 118:27:40 3 minutes 27 seconds ( RealVideo Clip: 0.9 Mb or MPG Video Clip: 31 Mb ). Both clips by Ken Glover. Journal Text: 118:30:03 RealVideo Clip: (25 minutes 29 seconds) by Mick Hyde. Journal Text: 118:31:01 3 minutes 41 seconds ( RealVideo Clip: 0.9 Mb or MPG Video Clip: 33 Mb ). Both clips by Ken Glover. Journal Text: 118:34:33 3 minutes 07 seconds ( RealVideo Clip: 0.8 Mb or MPG Video Clip: 27 Mb ). Both clips by Ken Glover. Journal Text: 118:37:25 3 minutes 27 seconds ( RealVideo Clip: 0.9 Mb or MPG Video Clip: 31 Mb ). Both clips by Ken Glover. Journal Text: 118:38:54 QuickTime Clip: (2 minutes 27 seconds; 1.7 MB) by Peter Dayton. 360-degree panorama beside the lunar module: While Gene works beside the lunar rover and Jack, out of view, offloads ALSEP equipment from behind the lunar module, the television camera goes sightseeing, panning slowly anti-clockwise. The scene begins with Gene loading equipment on the rover and moves westwards to reveal a flat foreground with mountains on the horizon in all directions. The lunar module shadow comes into view, and a rock on the ground interests Houston. Camera operator Ed Fendell stops panning and zooms in on the rock which has quite a long shadow, showing just how low the sun is in the sky. The pan continues and the lunar module descent stage appears and, further on, the flag emerges. Finally, the camera returns to find Gene - he has just finished mounting the Explosion Package Transporter (seismic charges) on the back of the rover. Throughout the clip, the astronauts exchange technical conversation and relaxed banter with Bob Parker in Houston. Journal Text: 118:40:45 2 minutes 50 seconds ( RealVideo Clip: 0.6 Mb or MPG Video Clip: 25 Mb ). Both clips by Ken Glover. Journal Text: 118:41:24 QuickTime Clip: (1.7 MB) by Peter Dayton. 360-degree panorama beside the lunar module: Beginning with the flag in view, the camera tracks clockwise, finds the lunar module descent stage, continues on to view the surface and completes the pan when the rover comes into view with the flag in the background. The camera pans slightly to the left now and finds Gene looking for lunar traverse maps at the rover. He waves to the camera and says, Hello, Houston. The soundtrack contains more technical conversations: Gene talks about the Traverse Gravimeter Experiment and Surface Electric Properties experiment; Jack talks about the Radioisotopic Thermoelectric Generator he's working on; and voices on the flight director communication loop in Houston discuss the experiments and the EVA timeline. Journal Text: 118:43:28 3 minutes 01 seconds ( RealVideo Clip: 0.8 Mb or MPG Video Clip: 27 Mb ). Both clips by Ken Glover. Journal Text: 118:46:27 3 minutes 15 seconds ( RealVideo Clip: 0.8 Mb or MPG Video Clip: 29 Mb ). Both clips by Ken Glover. Journal Text: 118:49:42 2 minutes 52 seconds ( RealVideo Clip: 0.7 Mb or MPG Video Clip: 25 Mb ). Both clips by Ken Glover. Journal Text: 118:50:53 QuickTime Clip: (3 minutes 5 seconds; 2.2 MB) by Peter Dayton. Jack carries the ALSEP package and goes looking for a site to deploy it, west of the lunar module. Meanwhile, Gene breaks off part of the left-rear fender of the rover when he catches the hammer in his leg pocket against it (heard, not seen in the video clip). He goes looking for a roll of duct tape under his rover seat to make a repair. Meanwhile, Jack continues west, puffing audibly under his ALSEP load - 60 pounds on the moon - and, despite his labors, the professional geologist makes detailed remarks about the rocks and soil conditions he sees while he walks - his heavy feet drag a dark trail in the soil. When he pauses to rest, he switches his suit to maximum cooling (his heart rate reaches 140 beats per minute while carrying the ALSEP). Voices on the flight director loop discuss repairing the broken fender as well as Jack's progress, suggesting he carry the ALSEP barbell in the crooks of his elbows instead of in his hands. Journal Text: 118:52:28 3 minutes 04 seconds ( RealVideo Clip: 0.8 Mb or MPG Video Clip: 27 Mb ). Both clips by Ken Glover. Journal Text: 118:56:10 RealVideo Clip: (8 minutes 10 seconds) by Mick Hyde. Journal Text: 118:58:03 RealVideo Clip: (1 minute 6 seconds) by Mick Hyde. Journal Text: 118:58:14 QuickTime Clip: (2 minutes 36 seconds; 1.8 MB) by Peter Dayton. Gene works to repair the rover's broken fender while Jack reaches the ALSEP site. The clip opens to show Gene tearing off a strip of duct tape from a roll and applying it to the fender. Jack asks Bob Parker if they can see him and Bob says No, but a voice from the backroom in Houston points out that he has just appeared at the left of the picture as a white spot in the distance. The EVA controller advises the flight director that Gene is now twenty minutes behind in his timeline. The camera leaves Gene at the rover and zooms to find Jack resting and evaluating his chosen ALSEP site area, the experiments package beside him on the ground. He discusses the site with the capcom, who informs him he is ten minutes behind in his timeline. He picks up the ALSEP, moves it a few meters to his left, discusses experiment placement requirements with Bob, and the backroom Experiments team reacts to his questions and remarks. Journal Text: 118:58:33 2 minutes 55 seconds ( RealVideo Clip: 0.7 Mb or MPG Video Clip: 25 Mb ). Both clips by Ken Glover. Journal Text: 119:01:14 3 minutes 44 seconds ( RealVideo Clip: 1.0 Mb or MPG Video Clip: 33 Mb ). Both clips by Ken Glover. Journal Text: 119:13:05 RealVideo Clip: (14 minutes 15 seconds) by Mick Hyde. Journal Text: 119:16:16 3 minutes 18 seconds ( RealVideo Clip: 0.8 Mb or MPG Video Clip: 29 Mb ). Both clips by Ken Glover. Journal Text: 119:18:22 QuickTime Clip: (1 minute 43 seconds; 1.2 MB) by Peter Dayton. Television coverage of early ALSEP setup: Cernan has driven 190 meters west from the lunar module to the ALSEP site and parked the rover facing east into the sun, about 18 meters northeast of the ALSEP Central Station. This places the rover battery radiators in the shade to promote battery cooling. The scene shows Jack, in front of the the South Massif, using the Universal Handling Tool (UHT) to undo bolts that fasten the Long-Period Surface Gravimeter (LSG: gravity-wave experiment) to the ALSEP pallet. The dark object on the ground to his left is the Radioisotopic Thermoelectric Generator (RTG). He moves to the right carrying the LSG and snares his boot in the cable leading to the Lunar Ejecta and Meteorite experiment. He avoids doing damage and moves further to the right, the camera following, to place the LSG on the surface, first discarding the thermal/dust cover on the ground behind him. The TELMU controller [telemetry, electrical, EVA mobility unit officer - the lunar module environment controller] tells the flight director that Schmitt has been using maximum cooling in his spacesuit for 25 minutes. The EVA controller comes on the flight director's loop repeating the information, and suggests that the capcom remind Jack of the setting he is using to prevent excessive water usage, which might shorten the EVA. A discussion follows on the loop exploring whether Jack's maximum cooling setting was deliberate or accidental. Meanwhile, Gene comes into view deploying the Heat Flow Experiment (HFE). Journal Text: 119:19:20 3 minutes 41 seconds ( RealVideo Clip: 0.9 Mb or MPG Video Clip: 33 Mb ). Both clips by Ken Glover. Journal Text: 119:22:55 3 minutes 41 seconds ( RealVideo Clip: 0.9 Mb or MPG Video Clip: 33 Mb ). Both clips by Ken Glover. Journal Text: 119:23:10 QuickTime Clip: (1 minute 19 seconds; 0.95 MB) by Peter Dayton. Jack is using his UHT to position the cable between the RTG and the Central Station while Gene, off-camera, announces that he has gotten some dirt on the heat flow experiment. He asks Houston if that matters and a brief discussion on the flight director loop results in the capcom replying to Gene that it causes no concern. Jack moves around the Central Station and hops cautiously over the cable leading to the HFE just as Gene moves the experiment, causing the cable to rise off the ground. For a moment, Jack's odd little hopping steps and the lifting of the cable off the ground look like the beginning of a lunar rope-skipping game. Journal Text: 119:26:31 3 minutes 27 seconds ( RealVideo Clip: 0.9 Mb or MPG Video Clip: 31 Mb ). Both clips by Ken Glover. Journal Text: 119:27:40 RealVideo Clip: (25 minutes 38 seconds) by Mick Hyde. Journal Text: 119:28:14 QuickTime Clip: (2 minutes 17 seconds; 1.6 MB) by Peter Dayton. Gene extends the three legs of the drill stem stand (off-camera, he says, One leg, two legs, three legs) while Jack moves to the ALSEP pallet and uses his UHT to release the Lunar Mass Spectrometer (LMS) from the pallet. As Jack hops sideways, carrying the LMS and extending its cable, Gene comes into view from the right carrying the drill, drill stems, and stem rack. Gene places his bundle on the ground, first the stem rack tripod, then the drill (the bag with handles), and finally the bag of stems. Before leaning the stems against the rack on the ground, he removes the cover like someone pulling a rolled map from a cardboard tube, and flings the cover off to his right. Meanwhile, the flight surgeon reports to the flight director: BTU update for the first 15 minutes of Hour 3: CDR ten-fifty, LMP fifteen hundred. So, Jack is burning more energy at this point. Journal Text: 119:29:48 3 minutes 4 seconds ( RealVideo Clip: 0.8 Mb or MPG Video Clip: 27 Mb ). Both clips by Ken Glover. Journal Text: 119:31:56 QuickTime Clip: (2 minutes 36 seconds; 1.8 MB) by Peter Dayton. Gene drills a hole: The drill stem package leans against the stem rack on the ground in front of Gene as he moves into position to drill a hole. The Experiments team reports to the flight director that they would like to have the next perimeter reading at the ALSEP done on the ground, and Jack reports that the Lunar Mass Spectrometer is deployed. Gene throws the drill cover away and begins boring. The tendency of astronauts on the moon to find their centre of gravity by leaning forward causes him to push forward on the drill. It enters the ground at an angle and causes concern to be voiced on the flight director loop. Bob Parker passes the concern on to Gene and he brings the drill stem back to a vertical position. The EVA controller offers further drilling guidelines to the flight director. Journal Text: 119:32:49 3 minutes 4 seconds ( RealVideo Clip: 1.0 Mb or MPG Video Clip: 35 Mb ). Both clips by Ken Glover. Journal Text: 119:35:45 QuickTime Clip: (1 minute 54 seconds; 1.3 MB) by Peter Dayton. View of the astronauts performing separate tasks: Jack is leveling the Central Station in the background and experiencing difficulty. Gene has finished drilling and bends to remove the wrench from the stem rack. He loses balance and stumbles but recovers without falling. After attaching the wrench to the drill stem, he rotates the drill to detach it from the stem and places it on the ground. Meanwhile, conversation on the flight director loop establishes that getting the Central Station level is more critical than keeping it absolutely free of soil, and the Capcom passes the information to Jack. Journal Text: 119:36:39 3 minutes 21 seconds ( RealVideo Clip: 0.9 Mb or MPG Video Clip: 30 Mb ). Both clips by Ken Glover. Journal Text: 119:39:53 2 minutes 58 seconds ( RealVideo Clip: 0.8 Mb or MPG Video Clip: 26 Mb ). Both clips by Ken Glover. Journal Text: 119:42:48 3 minutes 47 seconds ( RealVideo Clip: 1.0 Mb or MPG Video Clip: 34 Mb ). Both clips by Ken Glover. Journal Text: 119:46:30 3 minutes 50 seconds ( RealVideo Clip: 1.0 Mb or MPG Video Clip: 34 Mb ). Both clips by Ken Glover. Journal Text: 119:50:15 4 minutes 01 seconds ( RealVideo Clip: 1.0 Mb or MPG Video Clip: 36 Mb ). Both clips by Ken Glover. Journal Text: 119:53:35 RealVideo Clip: (25 minutes 52 seconds) by Mick Hyde. Journal Text: 119:54:03 3 minutes 15 seconds ( RealVideo Clip: 0.8 Mb or MPG Video Clip: 29 Mb ). Both clips by Ken Glover. Journal Text: 119:57:09 3 minutes 13 seconds ( RealVideo Clip: 0.8 Mb or MPG Video Clip: 29 Mb ). Both clips by Ken Glover. Journal Text: 120:00:11 3 minutes 18 seconds ( RealVideo Clip: 0.8 Mb or MPG Video Clip: 29 Mb ). Both clips by Ken Glover. Journal Text: 120:03:25 3 minutes 18 seconds ( RealVideo Clip: 0.9 Mb or MPG Video Clip: 30 Mb ). Both clips by Ken Glover. Journal Text: 120:06:38 2 minutes 55 seconds ( RealVideo Clip: 0.7 Mb or MPG Video Clip: 26 Mb ). Both clips by Ken Glover. Journal Text: 120:09:26 3 minutes 18 seconds ( RealVideo Clip: 0.8 Mb or MPG Video Clip: 29 Mb ). Both clips by Ken Glover. Journal Text: 120:12:08 3 minutes 10 seconds ( RealVideo Clip: 0.8 Mb or MPG Video Clip: 28 Mb ). Both clips by Ken Glover. Journal Text: 120:13:29 3 minutes 18 seconds ( RealVideo Clip: 0.8 Mb or MPG Video Clip: 29 Mb ). Both clips by Ken Glover. Journal Text: 120:16:35 3 minutes 24 seconds ( RealVideo Clip: 0.9 Mb or MPG Video Clip: 30 Mb ). Both clips by Ken Glover. Journal Text: 120:19:48 RealVideo Clip: (5 minutes 23 seconds) by Mick Hyde. Journal Text: 120:19:48 2 minutes 47 seconds ( RealVideo Clip: 0.7 Mb or MPG Video Clip: 27 Mb ). Both clips by Ken Glover. Journal Text: 120:22:36 4 minutes 04 seconds ( RealVideo Clip: 1.0 Mb or MPG Video Clip: 40 Mb ). Both clips by Ken Glover. Journal Text: 120:27:41 RealVideo Clip: (18 minutes 29 seconds) by Mick Hyde. Journal Text: 120:29:20 4 minutes 01 seconds ( RealVideo Clip: 1.0 Mb or MPG Video Clip: 40 Mb ). Both clips by Ken Glover. Journal Text: 120:33:02 4 minutes 01 seconds ( RealVideo Clip: 0.8 Mb or MPG Video Clip: 31 Mb ). Both clips by Ken Glover. Journal Text: 120:36:02 3 minutes 06 seconds ( RealVideo Clip: 0.8 Mb or MPG Video Clip: 31 Mb ). Both clips by Ken Glover. Journal Text: 120:39:05 4 minutes 19 seconds ( RealVideo Clip: 1.1 Mb or MPG Video Clip: 43 Mb ). Both clips by Ken Glover. Journal Text: 120:43:14 3 minutes 16 seconds ( RealVideo Clip: 0.8 Mb or MPG Video Clip: 33 Mb ). Both clips by Ken Glover. Journal Text: 120:46:25 3 minutes 41 seconds ( RealVideo Clip: 0.9 Mb or MPG Video Clip: 36 Mb ). Both clips by Ken Glover. Journal Text: 120:50:02 3 minutes 27 seconds ( RealVideo Clip: 0.9 Mb or MPG Video Clip: 34 Mb ). Both clips by Ken Glover. Journal Text: 120:53:22 3 minutes 56 seconds ( RealVideo Clip: 1.0 Mb or MPG Video Clip: 39 Mb ). Both clips by Ken Glover. Journal Text: 120:57:05 4 minutes 33 seconds ( RealVideo Clip: 1.1 Mb or MPG Video Clip: 45 Mb ). Both clips by Ken Glover. Journal Text: 121:00:02 RealVideo Clip: (4 minutes 2 seconds) by Mick Hyde. Jack's spectacular fall during the deep core extraction at the ALSEP site. Journal Text: 121:01:30 3 minutes 10 seconds ( RealVideo Clip: 0.8 Mb or MPG Video Clip: 31 Mb ). Both clips by Ken Glover. Journal Text: 121:04:31 2 minutes 21 seconds ( RealVideo Clip: 0.6 Mb or MPG Video Clip: 23 Mb ). Both clips by Ken Glover. Journal Text: 121:06:45 3 minutes 15 seconds ( RealVideo Clip: 0.8 Mb or MPG Video Clip: 32 Mb ). Both clips by Ken Glover. Journal Text: 121:10:02 1 minutes 44 seconds ( RealVideo Clip: 0.4 Mb or MPG Video Clip: 17 Mb ). Both clips by Ken Glover. Journal Text: 121:11:19 3 minutes 50 seconds ( RealVideo Clip: 1.0 Mb or MPG Video Clip: 38 Mb ). Both clips by Ken Glover. Journal Text: 121:15:27 3 minutes 15 seconds ( RealVideo Clip: 0.8 Mb or MPG Video Clip: 32 Mb ). Both clips by Ken Glover. Journal Text: 121:18:20 3 minutes 47 seconds ( RealVideo Clip: 1.0 Mb or MPG Video Clip: 38 Mb ). Both clips by Ken Glover. Journal Text: 121:21:55 3 minutes 15 seconds ( RealVideo Clip: 0.8 Mb or MPG Video Clip: 32 Mb ). Both clips by Ken Glover. Journal Text: 121:24:57 3 minutes 33 seconds ( RealVideo Clip: 0.9 Mb or MPG Video Clip: 35 Mb ). Both clips by Ken Glover. Journal Text: 121:28:30 3 minutes 38 seconds ( RealVideo Clip: 0.9 Mb or MPG Video Clip: 36 Mb ). Both clips by Ken Glover. Journal Text: 121:31:58 4 minutes 07 seconds ( RealVideo Clip: 1.0 Mb or MPG Video Clip: 41 Mb ). Both clips by Ken Glover. Journal Text: 121:35:45 RealVideo Clip: (1 minute 12 seconds) by Mick Hyde. Journal Text: 121:36:13 43 seconds ( RealVideo Clip: 0.2 Mb or MPG Video Clip: 7 Mb ). Both clips by Ken Glover. Journal Text: 122:07:01 RealVideo Clip: (25 minutes 35 seconds) by Mick Hyde. Journal Text: 122:07:06 2 minutes 50 seconds ( RealVideo Clip: 0.7 Mb or MPG Video Clip: 28 Mb ). Both clips by Ken Glover. Journal Text: 122:09:43 3 minutes 30 seconds ( RealVideo Clip: 0.9 Mb or MPG Video Clip: 34 Mb ). Both clips by Ken Glover. Journal Text: 122:13:09 3 minutes 33 seconds ( RealVideo Clip: 0.9 Mb or MPG Video Clip: 35 Mb ). Both clips by Ken Glover. Journal Text: 122:16:41 3 minutes 38 seconds ( RealVideo Clip: 0.9 Mb or MPG Video Clip: 36 Mb ). Both clips by Ken Glover. Journal Text: 122:20:11 3 minutes 33 seconds ( RealVideo Clip: 0.9 Mb or MPG Video Clip: 35 Mb ). Both clips by Ken Glover. Journal Text: 122:23:40 3 minutes 18 seconds ( RealVideo Clip: 0.8 Mb or MPG Video Clip: 33 Mb ). Both clips by Ken Glover. Journal Text: 122:26:41 2 minutes 41 seconds ( RealVideo Clip; 0.7 Mb or MPG Video Clip: 26 Mb ). Both clips by Ken Glover. Journal Text: 122:29:10 3 minutes 44 seconds ( RealVideo Clip; 1.0 Mb or MPG Video Clip: 37 Mb ). Both clips by Ken Glover. Journal Text: 122:55:05 RealVideo Clip: (17 minutes 25 seconds) by Mick Hyde. Journal Text: 122:55:05 3 minutes 21 seconds ( RealVideo Clip; 0.9 Mb or MPG Video Clip: 33 Mb ). Both clips by Ken Glover. Journal Text: 122:59:01 3 minutes 33 seconds ( RealVideo Clip; 0.9 Mb or MPG Video Clip: 35 Mb ). Both clips by Ken Glover. Journal Text: 123:02:28 3 minutes 56 seconds ( RealVideo Clip; 1.0 Mb or MPG Video Clip: 39 Mb ). Both clips by Ken Glover. Journal Text: 123:06:24 3 minutes 30 seconds ( RealVideo Clip; 0.9 Mb or MPG Video Clip: 35 Mb ). Both clips by Ken Glover. Journal Text: 123:09:49 3 minutes 50 seconds ( RealVideo Clip; 1.0 Mb or MPG Video Clip: 38 Mb ). Both clips by Ken Glover. Journal Text: 123:18:35 RealVideo Clip: (8 minutes 38 seconds) by Mick Hyde. Journal Text: 123:18:35 2 minutes 50 seconds ( RealVideo Clip; 0.7 Mb or MPG Video Clip: 28 Mb ). Both clips by Ken Glover. Journal Text: 123:21:19 3 minutes 10 seconds ( RealVideo Clip; 0.8 Mb or MPG Video Clip: 31 Mb ). Both clips by Ken Glover. Journal Text: 123:27:46 RealVideo Clip: (4 minutes 28 seconds) by Mick Hyde. Journal Text: 123:27:46 4 minutes 32 seconds ( RealVideo Clip; 1.1 Mb or MPG Video Clip: 45 Mb ). Both clips by Ken Glover. Journal Text: 140:45:27 RealVideo Clip: (20 minutes 36 seconds) by Mick Hyde. Journal Text: 140:45:27 3 minutes 36 seconds ( RealVideo Clip; 0.9 Mb or MPG Video Clip: 32 Mb ). Both clips by Ken Glover. Journal Text: 140:48:55 3 minutes 36 seconds ( RealVideo Clip; 1.0 Mb or MPG Video Clip: 35 Mb ). Both clips by Ken Glover. Journal Text: 140:52:26 3 minutes 36 seconds ( RealVideo Clip; 0.9 Mb or MPG Video Clip: 36 Mb ). Both clips by Ken Glover. Journal Text: 140:55:57 3 minutes 01 seconds ( RealVideo Clip; 0.8 Mb or MPG Video Clip: 30 Mb ). Both clips by Ken Glover. Journal Text: 140:58:51 3 minutes 44 seconds ( RealVideo Clip; 1.0 Mb or MPG Video Clip: 37 Mb ). Both clips by Ken Glover. Journal Text: 141:02:27 4 minutes 13 seconds ( RealVideo Clip; 1.1 Mb or MPG Video Clip: 42 Mb ). Both clips by Ken Glover. Journal Text: 141:06:25 RealVideo Clip: (15 minutes 10 seconds) by Mick Hyde. Journal Text: 141:07:19 3 minutes 24 seconds ( RealVideo Clip; 0.9 Mb or MPG Video Clip: 34 Mb ). Both clips by Ken Glover. Journal Text: 141:09:56 1 minutes 06 seconds ( RealVideo Clip; 0.3 Mb or MPG Video Clip: 11 Mb ). Both clips by Ken Glover. Journal Text: 141:10:56 3 minutes 21 seconds ( RealVideo Clip; 0.9 Mb or MPG Video Clip: 33 Mb ). Both clips by Ken Glover. Journal Text: 141:14:19 3 minutes 47 seconds ( RealVideo Clip; 1.0 Mb or MPG Video Clip: 37 Mb ). Both clips by Ken Glover. Journal Text: 141:17:57 4 minutes 04 seconds ( RealVideo Clip; 1.1 Mb or MPG Video Clip: 40 Mb ). Both clips by Ken Glover. Journal Text: 142:45:50 2 minutes 41 seconds ( RealVideo Clip; 0.7 Mb or MPG Video Clip: 27 Mb ). Both clips by Ken Glover. Journal Text: 142:46:06 RealVideo Clip: (11 minute 20 seconds) by Mick Hyde. Journal Text: 142:48:34 3 minutes 41 seconds ( RealVideo Clip; 1.0 Mb or MPG Video Clip: 36 Mb ). Both clips by Ken Glover. Journal Text: 142:52:06 2 minutes 55 seconds ( RealVideo Clip; 0.8 Mb or MPG Video Clip: 29 Mb ). Both clips by Ken Glover. Journal Text: 142:55:00 2 minutes 32 seconds ( RealVideo Clip; 0.7 Mb or MPG Video Clip: 25 Mb ). Both clips by Ken Glover. Journal Text: 142:57:22 3 minutes 47 seconds ( RealVideo Clip; 1.0 Mb or MPG Video Clip: 38 Mb ). Both clips by Ken Glover. Journal Text: 143:01:06 3 minutes 24 seconds ( RealVideo Clip; 0.9 Mb or MPG Video Clip: 34 Mb ). Both clips by Ken Glover. Journal Text: 143:04:22 3 minutes 53 seconds ( RealVideo Clip; 1.0 Mb or MPG Video Clip: 39 Mb ). Both clips by Ken Glover. Journal Text: 143:08:09 3 minutes 21 seconds ( RealVideo Clip; 0.9 Mb or MPG Video Clip: 33 Mb ). Both clips by Ken Glover. Journal Text: 143:11:32 3 minutes 24 seconds ( RealVideo Clip; 0.9 Mb or MPG Video Clip: 34 Mb ). Both clips by Ken Glover. Journal Text: 143:14:52 3 minutes 21 seconds ( RealVideo Clip; 0.8 Mb or MPG Video Clip: 33 Mb ). Both clips by Ken Glover. Journal Text: 143:18:10 2 minutes 32 seconds ( RealVideo Clip; 0.6 Mb or MPG Video Clip: 25 Mb ). Both clips by Ken Glover. Journal Text: 143:20:39 3 minutes 15 seconds ( RealVideo Clip; 0.8 Mb or MPG Video Clip: 32 Mb ). Both clips by Ken Glover. Journal Text: 143:23:47 RealVideo Clip: (21 minute 33 seconds) by Mick Hyde. Journal Text: 143:23:47 2 minutes 50 seconds ( RealVideo Clip; 0.7 Mb or MPG Video Clip: 28 Mb ). Both clips by Ken Glover. Journal Text: 143:26:34 2 minutes 32 seconds ( RealVideo Clip; 0.7 Mb or MPG Video Clip: 25 Mb ). Both clips by Ken Glover. Journal Text: 143:27:55 QuickTime Clip: (34 seconds; 0.4 MB) by Peter Dayton. Gene uses a kangaroo hop style of locomotion, bounding down the steep South Massif and kicking up sprays of soil. He joins Jack who has found an interesting white clast in a one- to two-metre boulder. Gene will shortly hammer fragments from Boulder 3 which will turn out to be the oldest rock samples returned from the moon - 4.6 billion years old. The astronauts are exceptionally buoyant in this clip and Gene is delighted with Jack's discovery, commending him repeatedly, Good eye, good eye! (The structure in the foreground is the lunar rover). Journal Text: 143:29:03 3 minutes 30 seconds ( RealVideo Clip; 0.9 Mb or MPG Video Clip: 35 Mb ). Both clips by Ken Glover. Journal Text: 143:32:18 3 minutes 36 seconds ( RealVideo Clip; 1.0 Mb or MPG Video Clip: 36 Mb ). Both clips by Ken Glover. Journal Text: 143:33:40 QuickTime Clip: (1 minute 26 seconds; 1 MB) by Peter Dayton. Jack, at left, is leaning down to take a close look at the boulder they have just sampled. When he stands, Gene kicks it and it rolls downhill towards Jack, who kicks it on a little further. Seeing the protected soil that lay under the rock, Gene proposes taking a sample of it. Jack collects the soil and pours it into the bag proffered by Gene. Because Gene is uphill of him, Jack has to stretch and hop up to pour the sample successfully into the bag. Meanwhile, the Experiments backroom informs the flight director that they would like another rake sample. Journal Text: 143:35:59 3 minutes 44 seconds ( RealVideo Clip; 1.0 Mb or MPG Video Clip: 37 Mb ). Both clips by Ken Glover. Journal Text: 143:39:38 2 minutes 32 seconds ( RealVideo Clip; 0.7 Mb or MPG Video Clip: 25 Mb ). Both clips by Ken Glover. Journal Text: 143:42:04 3 minutes 41 seconds ( RealVideo Clip; 1.0 Mb or MPG Video Clip: 36 Mb ). Both clips by Ken Glover. Journal Text: 144:30:46 RealVideo Clip: (13 minutes) by Mick Hyde. Journal Text: 144:30:46 2 minutes 55 seconds ( RealVideo Clip; 0.8 Mb or MPG Video Clip: 29 Mb ). Both clips by Ken Glover. Journal Text: 144:33:36 3 minutes 28 seconds ( RealVideo Clip; 0.9 Mb or MPG Video Clip: 36 Mb ). Both clips by Ken Glover. Journal Text: 144:37:09 2 minutes 58 seconds ( RealVideo Clip; 0.8 Mb or MPG Video Clip: 29 Mb ). Both clips by Ken Glover. Journal Text: 144:40:02 2 minutes 58 seconds ( RealVideo Clip; 0.9 Mb or MPG Video Clip: 35 Mb ). Both clips by Ken Glover. Journal Text: 144:43:30 3 minutes 27 seconds ( RealVideo Clip; 0.9 Mb or MPG Video Clip: 34 Mb ). Both clips by Ken Glover. Journal Text: 144:47:00 3 minutes 30 seconds ( RealVideo Clip; 0.9 Mb or MPG Video Clip: 35 Mb ). Both clips by Ken Glover. Journal Text: 144:50:23 3 minutes 50 seconds ( RealVideo Clip; 1.0 Mb or MPG Video Clip: 38 Mb ). Both clips by Ken Glover. Journal Text: 144:50:52 QuickTime Clip: (1 minute 13 seconds; 0.9 MB) by Peter Dayton. Journal Text: 144:54:04 4 minutes 21 seconds ( RealVideo Clip; 1.1 Mb or MPG Video Clip: 43 Mb ). Both clips by Ken Glover. Journal Text: 144:58:45 2 minutes 15 seconds ( RealVideo Clip; 0.6 Mb or MPG Video Clip: 22 Mb ). Both clips by Ken Glover. Journal Text: 145:00:57 2 minutes 52 seconds ( RealVideo Clip; 0.8 Mb or MPG Video Clip: 28 Mb ). Both clips by Ken Glover. Journal Text: 145:23:48 RealVideo Clip: (15 minutes 50 seconds) by Mick Hyde. Journal Text: 145:23:48 3 minutes 36 seconds ( RealVideo Clip; 1.0 Mb or MPG Video Clip: 35 Mb ). Both clips by Ken Glover. Journal Text: 145:27:50 3 minutes 07 seconds ( RealVideo Clip; 0.8 Mb or MPG Video Clip: 31 Mb ). Both clips by Ken Glover. Journal Text: 145:30:58 3 minutes 10 seconds ( RealVideo Clip; 0.8 Mb or MPG Video Clip: 31 Mb ). Both clips by Ken Glover. Journal Text: 145:34:00 2 minutes 29 seconds ( RealVideo Clip; 0.7 Mb or MPG Video Clip: 25 Mb ). Both clips by Ken Glover. Journal Text: 145:36:24 3 minutes 56 seconds ( RealVideo Clip; 1.0 Mb or MPG Video Clip: 39 Mb ). Both clips by Ken Glover. Journal Text: 145:39:20 RealVideo Clip: (6 minutes) by Mick Hyde. Journal Text: 145:40:22 3 minutes 15 seconds ( RealVideo Clip; 0.8 Mb or MPG Video Clip: 32 Mb ). Both clips by Ken Glover. Journal Text: 145:43:31 1 minutes 58 seconds ( RealVideo Clip; 0.5 Mb or MPG Video Clip: 19 Mb ). Both clips by Ken Glover. Journal Text: 145:45:28 RealVideo Clip: (9 minutes 16 seconds) by Mick Hyde. Journal Text: 145:45:28 2 minutes 47 seconds ( RealVideo Clip; 0.8 Mb or MPG Video Clip: 28 Mb ). Both clips by Ken Glover. Journal Text: 145:48:06 3 minutes 27 seconds ( RealVideo Clip; 0.9 Mb or MPG Video Clip: 34 Mb ). Both clips by Ken Glover. Journal Text: 145:51:22 3 minutes 27 seconds ( RealVideo Clip; 0.9 Mb or MPG Video Clip: 34 Mb ). Both clips by Ken Glover. Journal Text: 146:26:36 RealVideo Clip: (15 minutes 36 seconds) by Mick Hyde. Journal Text: 146:26:36 3 minutes 50 seconds ( RealVideo Clip; 1.0 Mb or MPG Video Clip: 38 Mb ). Both clips by Ken Glover. Journal Text: 146:30:19 3 minutes 21 seconds ( RealVideo Clip; 0.9 Mb or MPG Video Clip: 33 Mb ). Both clips by Ken Glover. Journal Text: 146:30:19 QuickTime Clip: (1 minute 16 seconds; 0.9 MB) by Peter Dayton. Journal Text: 146:33:29 2 minutes 58 seconds ( RealVideo Clip; 0.8 Mb or MPG Video Clip: 29 Mb ). Both clips by Ken Glover. Journal Text: 146:36:22 2 minutes 58 seconds ( RealVideo Clip; 0.8 Mb or MPG Video Clip: 31 Mb ). Both clips by Ken Glover. Journal Text: 146:39:24 3 minutes 13 seconds ( RealVideo Clip; 0.8 Mb or MPG Video Clip: 32 Mb ). Both clips by Ken Glover. Journal Text: 146:42:27 RealVideo Clip: (10 minutes 13 seconds) by Mick Hyde. Journal Text: 146:42:27 3 minutes 38 seconds ( RealVideo Clip; 0.9 Mb or MPG Video Clip: 35 Mb ). Both clips by Ken Glover. Journal Text: 146:46:00 3 minutes 47 seconds ( RealVideo Clip; 1.0 Mb or MPG Video Clip: 37 Mb ). Both clips by Ken Glover. Journal Text: 146:50:03 3 minutes 38 seconds ( RealVideo Clip; 1.0 Mb or MPG Video Clip: 36 Mb ). Both clips by Ken Glover. Journal Text: 147:15:19 RealVideo Clip: (14 minutes 38 seconds) by Mick Hyde. Journal Text: 147:15:19 3 minutes 38 seconds ( RealVideo Clip; 0.9 Mb or MPG Video Clip: 34 Mb ). Both clips by Ken Glover. Journal Text: 147:18:50 3 minutes 18 seconds ( RealVideo Clip; 0.9 Mb or MPG Video Clip: 33 Mb ). Both clips by Ken Glover. Journal Text: 147:22:06 3 minutes 33 seconds ( RealVideo Clip; 1.0 Mb or MPG Video Clip: 35 Mb ). Both clips by Ken Glover. Journal Text: 147:26:01 1 minutes 57 seconds ( RealVideo Clip; 0.6 Mb or MPG Video Clip: 20 Mb ). Both clips by Ken Glover. Journal Text: 147:27:51 2 minutes 35 seconds ( RealVideo Clip; 0.7 Mb or MPG Video Clip: 25 Mb ). Both clips by Ken Glover. Journal Text: 147:30:26 3 minutes 30 seconds ( RealVideo Clip; 0.9 Mb or MPG Video Clip: 35 Mb ). Both clips by Ken Glover. Journal Text: 147:33:48 3 minutes 21 seconds ( RealVideo Clip; 0.9 Mb or MPG Video Clip: 33 Mb ). Both clips by Ken Glover. Journal Text: 147:37:03 2 minutes 35 seconds ( RealVideo Clip; 0.7 Mb or MPG Video Clip: 26 Mb ). Both clips by Ken Glover. Journal Text: 147:38:32 MPEG Clip: (1 minute 29 seconds; 9.3 MB) by Kipp Teague. Gene is standing between the rover and lunar module taking pictures of the South Massif using the 500mm telephoto camera. He turns and shoots a sequence of pictures of the North Massif. Journal Text: 147:39:32 2 minutes 38 seconds ( RealVideo Clip; 0.7 Mb or MPG Video Clip: 26 Mb ). Both clips by Ken Glover. Journal Text: 147:45:46 29 seconds ( RealVideo Clip; 0.1 Mb or MPG Video Clip: 4 Mb ). Both clips by Ken Glover. Journal Text: 163:46:46 3 minutes 24 seconds ( RealVideo Clip; 0.9 Mb or MPG Video Clip: 33 Mb ). Both clips by Ken Glover. Journal Text: 163:49:56 3 minutes 10 seconds ( RealVideo Clip; 0.9 Mb or MPG Video Clip: 31 Mb ). Both clips by Ken Glover. Journal Text: 163:53:02 3 minutes 12 seconds ( RealVideo Clip; 0.9 Mb or MPG Video Clip: 32 Mb ). Both clips by Ken Glover. Journal Text: 163:56:11 4 minutes 19 seconds ( RealVideo Clip; 1.1 Mb or MPG Video Clip: 43 Mb ). Both clips by Ken Glover. Journal Text: 164:00:19 RealVideo Clip: (10 minutes 54 seconds) by Mick Hyde. Journal Text: 164:00:27 3 minutes 38 seconds ( RealVideo Clip; 0.9 Mb or MPG Video Clip: 36 Mb ). Both clips by Ken Glover. Journal Text: 164:04:18 3 minutes 12 seconds ( RealVideo Clip; 0.9 Mb or MPG Video Clip: 32 Mb ). Both clips by Ken Glover. Journal Text: 164:07:18 4 minutes 01 seconds ( RealVideo Clip; 1.0 Mb or MPG Video Clip: 40 Mb ). Both clips by Ken Glover. Journal Text: 164:53:44 3 minutes 21 seconds ( RealVideo Clip; 0.9 Mb or MPG Video Clip: 33 Mb ). Both clips by Ken Glover. Journal Text: 164:53:49 RealVideo Clip: (15 min 36 sec) by Mick Hyde. Journal Text: 164:56:58 3 minutes 27 seconds ( RealVideo Clip; 0.9 Mb or MPG Video Clip: 34 Mb ). Both clips by Ken Glover. Journal Text: 165:00:25 MPEG Clip: (52 seconds; 5.5 MB) by Kipp Teague. The rover is parked on the very steep flank of the North Massif. Gene is beside the rover, occupying about half the television camera frame, and is attaching the clip of his yo-yo to the handle of his tongs. As he moves away from the camera Jack is revealed behind him, perhaps 10-15 meters away up the steep hill, holding his scoop and taking a series of panorama pictures. In order to shoot each frame at this steeply slanted location, he bends his knees and tilts backwards to aim his lens correctly. 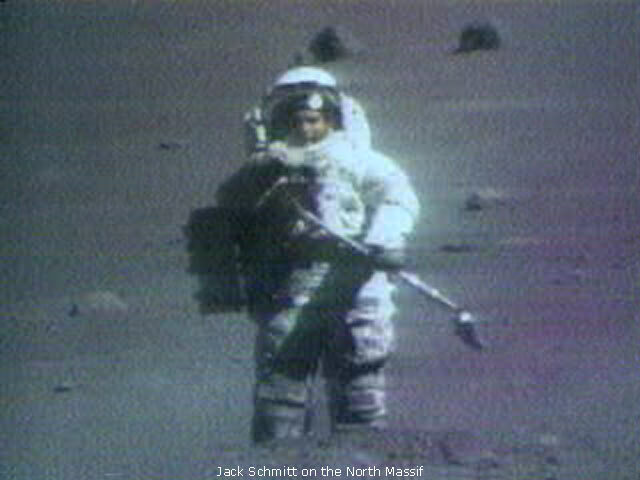 As the television camera zooms in on Jack, his visor is up and his face is visible inside his helmet with unusual clarity (video still). Journal Text: 165:00:25 3 minutes 21 seconds ( RealVideo Clip; 0.9 Mb or MPG Video Clip: 33 Mb ). Both clips by Ken Glover. Journal Text: 165:00:47 RealVideo Clip: (55 seconds) by Ken Glover. Journal Text: 165:00:53 QuickTime Clip: (1 minute 9 seconds; 0.8 MB) by Peter Dayton. Jack is uphill of the rover, arching backwards to point his camera while shooting panorama frames. The camera zooms in on him, finding his visor up and his face clearly revealed within his helmet. Bob Parker advises him to lower the visor to protect his face from the sun. Journal Text: 165:03:39 3 minutes 01 seconds ( RealVideo Clip; 0.8 Mb or MPG Video Clip: 30 Mb ). Both clips by Ken Glover. Journal Text: 165:06:38 3 minutes 04 seconds ( RealVideo Clip; 0.8 Mb or MPG Video Clip: 30 Mb ). Both clips by Ken Glover. Journal Text: 165:09:33 RealVideo Clip: (13 minutes 18 seconds) by Mick Hyde. Journal Text: 165:09:33 3 minutes 13 seconds ( RealVideo Clip; 0.8 Mb or MPG Video Clip: 32 Mb ). Both clips by Ken Glover. Journal Text: 165:12:43 3 minutes 07 seconds ( RealVideo Clip; 0.8 Mb or MPG Video Clip: 31 Mb ). Both clips by Ken Glover. Journal Text: 165:15:39 3 minutes 21 seconds ( RealVideo Clip; 0.8 Mb or MPG Video Clip: 33 Mb ). Both clips by Ken Glover. Journal Text: 165:18:56 3 minutes 59 seconds ( RealVideo Clip; 1.0 Mb or MPG Video Clip: 39 Mb ). Both clips by Ken Glover. Journal Text: 165:22:45 3 minutes 47 seconds ( RealVideo Clip; 1.0 Mb or MPG Video Clip: 37 Mb ). Both clips by Ken Glover. Journal Text: 165:26:35 3 minutes 56 seconds ( RealVideo Clip; 1.0 Mb or MPG Video Clip: 39 Mb ). Both clips by Ken Glover. Journal Text: 165:30:20 2 minutes 18 seconds ( RealVideo Clip; 0.6 Mb or MPG Video Clip: 23 Mb ). Both clips by Ken Glover. Journal Text: 165:32:28 3 minutes 07 seconds ( RealVideo Clip; 0.8 Mb or MPG Video Clip: 31 Mb ). Both clips by Ken Glover. Journal Text: 165:35:58 RealVideo Clip: (24 minutes 8 seconds) by Mick Hyde. Journal Text: 165:35:58 3 minutes 47 seconds ( RealVideo Clip; 0.9 Mb or MPG Video Clip: 37 Mb ). Both clips by Ken Glover. Journal Text: 165:36:33 QuickTime Clip: (48 seconds; 0.6 MB) by Peter Dayton. Gene comes bounding energetically down the mountain towards the rover. He loses his balance and falls to his knees, bounces forward on all fours, and his left foot kicks out an impressive spray of dust, perhaps 3 meters long, towards the rover camera. He rises and continues his traverse with undiminished attack. Journal Text: 165:39:40 3 minutes 41 seconds ( RealVideo Clip; 1.0 Mb or MPG Video Clip: 37 Mb ). Both clips by Ken Glover. Journal Text: 165:43:19 3 minutes 36 seconds ( RealVideo Clip; 0.9 Mb or MPG Video Clip: 35 Mb ). Both clips by Ken Glover. Journal Text: 165:46:46 3 minutes 36 seconds ( RealVideo Clip; 0.9 Mb or MPG Video Clip: 35 Mb ). Both clips by Ken Glover. Journal Text: 165:50:18 3 minutes 30 seconds ( RealVideo Clip; 0.9 Mb or MPG Video Clip: 35 Mb ). Both clips by Ken Glover. Journal Text: 165:52:27 RealVideo Clip: (1 minute 29 seconds) by Mick Hyde. Gene and Jack work on the steep slope below the rover. Journal Text: 165:53:36 3 minutes 21 seconds ( RealVideo Clip; 0.9 Mb or MPG Video Clip: 33 Mb ). Both clips by Ken Glover. Journal Text: 165:56:59 3 minutes 38 seconds ( RealVideo Clip; 1.0 Mb or MPG Video Clip: 36 Mb ). Both clips by Ken Glover. Journal Text: 166:11:07 3 minutes 21 seconds ( RealVideo Clip; 0.9 Mb or MPG Video Clip: 33 Mb ). Both clips by Ken Glover. Journal Text: 166:13:05 RealVideo Clip: (2 min 15 sec) by Mick Hyde. Journal Text: 166:14:03 QuickTime Clip: (1 minute 3 seconds; 0.75 MB) by Peter Dayton. Jack (furthest from camera) puts a rock sample in Gene's Sample Collection Bag. As Gene moves right to photograph a 4-meters-tall boulder, Jack collects his scoop off the ground by stepping on the head so the handle rotates up within reach. The television camera pans right following Gene as he approaches and photographs the large boulder. Meanwhile, Jack scoops surface samples. Journal Text: 166:14:23 2 minutes 15 seconds ( RealVideo Clip; 0.6 Mb or MPG Video Clip: 22 Mb ). Both clips by Ken Glover. Journal Text: 166:16:23 3 minutes 18 seconds ( RealVideo Clip; 0.8 Mb or MPG Video Clip: 33 Mb ). Both clips by Ken Glover. Journal Text: 166:19:52 3 minutes 36 seconds ( RealVideo Clip; 1.0 Mb or MPG Video Clip: 36 Mb ). Both clips by Ken Glover. Journal Text: 166:19:54 RealVideo Clip: (2 min 00 sec) by Mick Hyde. Journal Text: 166:23:24 3 minutes 44 seconds ( RealVideo Clip; 1.0 Mb or MPG Video Clip: 37 Mb ). Both clips by Ken Glover. Journal Text: 166:26:58 RealVideo Clip: (2 minutes 44 seconds) by Mick Hyde. Gene shoots a photographic panorama. Journal Text: 166:26:58 2 minutes 44 seconds ( RealVideo Clip; 0.7 Mb or MPG Video Clip: 27 Mb ). Both clips by Ken Glover. Journal Text: 166:50:14 3 minutes 33 seconds ( RealVideo Clip; 0.9 Mb or MPG Video Clip: 35 Mb ). Both clips by Ken Glover. Journal Text: 166:51:10 RealVideo Clip: (1 minute 6 seconds) by Mick Hyde. Journal Text: 166:53:34 3 minutes 56 seconds ( RealVideo Clip; 1.0 Mb or MPG Video Clip: 39 Mb ). Both clips by Ken Glover. Journal Text: 166:56:24 RealVideo Clip: (40 seconds) by Mick Hyde. Journal Text: 166:56:36 QuickTime Clip: (55 seconds; 0.7 MB) by Peter Dayton. Jack is in the middle distance, uphill from the television camera. He kicks the half-metre Station 8 boulder and sends it rolling down the slope. It travels a few meters with some further encouragement and finally comes to rest in a shallow depression. He climbs back uphill to where he found the rock so he can sample the ground on which it lay. Gene walks right in front of the camera, which begins a pan to the right to follow him. Journal Text: 166:57:30 3 minutes 27 seconds ( RealVideo Clip; 0.9 Mb or MPG Video Clip: 34 Mb ). Both clips by Ken Glover. Journal Text: 167:00:50 3 minutes 33 seconds ( RealVideo Clip; 0.9 Mb or MPG Video Clip: 35 Mb ). Both clips by Ken Glover. Journal Text: 167:01:51 QuickTime Clip: (1 minute 54 seconds; 1.3 MB) by Peter Dayton. The astronauts are in the middle distance, uphill from the television camera. Jack is to the left watching Gene, at right, hammering a fragment from the Station 8 boulder. The fragment flies downhill about 10 meters and Gene follows to retrieve it with his tongs. As he climbs back uphill the camera follows and finds Jack on the ground examining the rock closely and giving a detailed technical description of it. They bag the rock fragment and Jack climbs back up to a standing position. Journal Text: 167:04:16 3 minutes 47 seconds ( RealVideo Clip; 1.0 Mb or MPG Video Clip: 38 Mb ). Both clips by Ken Glover. Journal Text: 167:06:40 RealVideo Clip: (1 minute 18 seconds) by Mick Hyde. Jack pretends to ski downhill from the Station 8 boulder to the rover. Journal Text: 167:07:50 2 minutes 35 seconds ( RealVideo Clip; 0.7 Mb or MPG Video Clip: 25 Mb ). Both clips by Ken Glover. Journal Text: 167:09:20 RealVideo Clip: (3 minutes 21 seconds) by Mick Hyde. Journal Text: 167:09:30 QuickTime Clip: (49 seconds; 0.6 MB) by Peter Dayton. Gene comes kangaroo-hopping down the mountain towards the rover and remarks on how effective and fun the hopping technique is on a steep slope. He turns to his right and passes the television camera on a lateral traverse using 1-metre long hops. It pans left to follow him but can't match his speed, and loses him. Journal Text: 167:10:24 3 minutes 44 seconds ( RealVideo Clip; 1.0 Mb or MPG Video Clip: 37 Mb ). Both clips by Ken Glover. Journal Text: 167:10:56 QuickTime Clip: (1 minute 29 seconds; 1MB) by Peter Dayton. Jack is uphill of the rover, raking the soil for samples. The gnomon is on the ground just to his right. When he finishes and lifts the rake, a long dark shower of lunar dust spills to the ground. Gene enters the frame from the right bearing a sample bag to collect Jack's samples. The soundtrack contains debate about procedure on the flight director loop and, although Jack is the astronaut in the camera frame, it is Gene's voice (off-camera) that dominates the soundtrack in this clip. Journal Text: 167:13:15 QuickTime Clip: (59 seconds; 0.7 MB) by Peter Dayton. While Gene looks on and readies a sample bag, Jack uses the rake to scoop a kilogram sample of soil. The audio track is busy with the triple overlap of astronauts' voices, the CapCom, and backroom discussion on the flight director loop in mission control. Bob Parker asks the astronauts to finish work at this station in 11 minutes, but to dig a trench and shoot a photographic panorama first, if possible. Journal Text: 167:14:07 3 minutes 30 seconds ( RealVideo Clip; 0.9 Mb or MPG Video Clip: 35 Mb ). Both clips by Ken Glover. Journal Text: 167:17:28 2 minutes 50 seconds ( RealVideo Clip; 0.7 Mb or MPG Video Clip: 28 Mb ). Both clips by Ken Glover. Journal Text: 167:20:07 3 minutes 10 seconds ( RealVideo Clip; 0.8 Mb or MPG Video Clip: 31 Mb ). Both clips by Ken Glover. Journal Text: 167:20:22 RealVideo Clip: (2 minutes 21 seconds) by Mick Hyde. Jack adjusting his dust-clogged scoop head and sampling a trench he dug at Station 8. Journal Text: 167:22:59 3 minutes 10 seconds ( RealVideo Clip; 0.8 Mb or MPG Video Clip: 31 Mb ). Both clips by Ken Glover. Journal Text: 167:26:22 3 minutes 41 seconds ( RealVideo Clip; 1.0 Mb or MPG Video Clip: 36 Mb ). Both clips by Ken Glover. Journal Text: 167:27:35 RealVideo Clip: (3 minutes 4 seconds) by Mick Hyde. Jack and Gene returning to the Rover from the Station 8 trench and retrieving dropped sample bags. Journal Text: 167:29:56 2 minutes 21 seconds ( RealVideo Clip; 0.6 Mb or MPG Video Clip: 23 Mb ). Both clips by Ken Glover. Journal Text: 167:55:55 3 minutes 50 seconds ( RealVideo Clip; 1.0 Mb or MPG Video Clip: 38 Mb ). Both clips by Ken Glover. Journal Text: 167:59:33 3 minutes 13 seconds ( RealVideo Clip; 0.9 Mb or MPG Video Clip: 32 Mb ). Both clips by Ken Glover. Journal Text: 168:02:44 3 minutes 13 seconds ( RealVideo Clip; 0.9 Mb or MPG Video Clip: 34 Mb ). Both clips by Ken Glover. Journal Text: 168:03:30 RealVideo Clip: (1 minute 57 seconds) by Mick Hyde. Ed Fendell's initial Station 9 television pan and Gene's arrival at the rim of Van Serg Crater. Journal Text: 168:06:00 3 minutes 18 seconds ( RealVideo Clip; 0.8 Mb or MPG Video Clip: 33 Mb ). Both clips by Ken Glover. Journal Text: 168:09:10 3 minutes 04 seconds ( RealVideo Clip; 0.8 Mb or MPG Video Clip: 30 Mb ). Both clips by Ken Glover. Journal Text: 168:12:09 1 minutes 18 seconds ( RealVideo Clip; 0.3 Mb or MPG Video Clip: 13 Mb ). Both clips by Ken Glover. Journal Text: 168:13:25 3 minutes 27 seconds ( RealVideo Clip; 0.9 Mb or MPG Video Clip: 34 Mb ). Both clips by Ken Glover. Journal Text: 168:16:40 3 minutes 27 seconds ( RealVideo Clip; 0.9 Mb or MPG Video Clip: 34 Mb ). Both clips by Ken Glover. Journal Text: 168:19:57 3 minutes 30 seconds ( RealVideo Clip; 0.9 Mb or MPG Video Clip: 35 Mb ). Both clips by Ken Glover. Journal Text: 168:23:14 3 minutes 33 seconds ( RealVideo Clip; 0.9 Mb or MPG Video Clip: 35 Mb ). Both clips by Ken Glover. Gene's return to the rover from the Van Serg rim and Jack's continuing sampling activity. Journal Text: 168:26:26 3 minutes 21 seconds ( RealVideo Clip; 0.9 Mb or MPG Video Clip: 33 Mb ). Both clips by Ken Glover. Jack having further trouble with the scoop head, his return to the rover, and Gene taking 500mm photographs. Journal Text: 168:29:39 3 minutes 24 seconds ( RealVideo Clip; 0.9 Mb or MPG Video Clip: 33 Mb ). Both clips by Ken Glover. Journal Text: 168:30:49 RealVideo Clip: (2 minutes 09 seconds) by Mick Hyde. Gene and Jack sampling the white soil layer they uncovered near the rover at Station 9. Journal Text: 168:32:45 4 minutes 21 seconds ( RealVideo Clip; 1.1 Mb or MPG Video Clip: 43 Mb ). Both clips by Ken Glover. Journal Text: 168:36:53 3 minutes 35 seconds ( RealVideo Clip; 1.0 Mb or MPG Video Clip: 36 Mb ). Both clips by Ken Glover. Journal Text: 168:39:28 RealVideo Clip: (2 minutes 55 seconds) by Mick Hyde. Gene taking a double core sample at Station 9. Journal Text: 168:40:28 3 minutes 13 seconds ( RealVideo Clip; 0.9 Mb or MPG Video Clip: 32 Mb ). Both clips by Ken Glover. Journal Text: 168:43:28 3 minutes 18 seconds ( RealVideo Clip; 0.9 Mb or MPG Video Clip: 33 Mb ). Both clips by Ken Glover. Journal Text: 168:45:01 RealVideo Clip: (1 minute 00 seconds) by Mick Hyde. This television clip shows the flag on the seismic charge which Houston mistook for a distant object. Journal Text: 169:20:22 2 minutes 24 seconds ( RealVideo Clip; 0.7 Mb or MPG Video Clip: 24 Mb ). Both clips by Ken Glover. Journal Text: 169:20:48 RealVideo Clip: (1 minute 46 seconds) by Mick Hyde. Gene and Jack unloading the rover at the lunar module at the end of the third EVA. Journal Text: 169:22:28 2 minutes 47 seconds ( RealVideo Clip; 0.8 Mb or MPG Video Clip: 28 Mb ). Both clips by Ken Glover. Journal Text: 169:25:26 RealVideo Clip: (3 minutes 24 seconds) by Ken Glover. Journal Text: 169:28:21 RealVideo Clip: (3 minutes 38 seconds) by Ken Glover. Journal Text: 169:31:47 RealVideo Clip: (4 minutes 4 seconds) by Ken Glover. Journal Text: 169:35:47 RealVideo Clip: (3 minutes 24 seconds) by Ken Glover. Journal Text: 169:39:01 RealVideo Clip: (2 minutes 52 seconds) by Ken Glover. Journal Text: 169:41:46 4 minutes 53 seconds ( RealVideo Clip; 1.3 Mb or MPG Video Clip: 48 Mb ). Both clips by Ken Glover. Journal Text: 169:46:38 4 minutes 21 seconds ( RealVideo Clip; 1.1 Mb or MPG Video Clip: 43 Mb ). Both clips by Ken Glover. Journal Text: 169:50:45 2 minutes 18 seconds ( RealVideo Clip; 0.6 Mb or MPG Video Clip: 23 Mb ). Both clips by Ken Glover. Journal Text: 169:59:42 MPEG Clip: (19 seconds; 2.5MB) by Kipp Teague. This is a brief transmission from the rover as Gene drives it to the VIP site, its final parking spot. As he drives, a few seconds of television reaches earth and we see evidence of the uneven terrain as the rover rides up and down and side to side, causing some of its parts to jiggle, such as the high gain antenna. The lunar module pops in and out of the picture in the background, to the left of the picture. Journal Text: 170:02:38 3 minutes 13 seconds ( RealVideo Clip; 0.9 Mb or MPG Video Clip: 32 Mb ). Both clips by Ken Glover. Journal Text: 170:05:40 3 minutes 07 seconds ( RealVideo Clip; 0.8 Mb or MPG Video Clip: 31 Mb ). Both clips by Ken Glover. Journal Text: 170:08:41 3 minutes 13 seconds ( RealVideo Clip; 0.8 Mb or MPG Video Clip: 32 Mb ). Both clips by Ken Glover. Journal Text: 170:11:24 3 minutes 30 seconds ( RealVideo Clip; 0.9 Mb or MPG Video Clip: 35 Mb ). Both clips by Ken Glover. Journal Text: 170:14:46 3 minutes 18 seconds ( RealVideo Clip; 0.9 Mb or MPG Video Clip: 33 Mb ). Both clips by Ken Glover. Journal Text: 170:18:00 3 minutes 04 seconds ( RealVideo Clip; 0.8 Mb or MPG Video Clip: 30 Mb ). Both clips by Ken Glover. Journal Text: 170:20:50 3 minutes 33 seconds ( RealVideo Clip; 0.9 Mb or MPG Video Clip: 35 Mb ). Both clips by Ken Glover. Journal Text: 170:24:16 3 minutes 24 seconds ( RealVideo Clip; 0.9 Mb or MPG Video Clip: 33 Mb ). Both clips by Ken Glover. Journal Text: 170:27:16 2 minutes 27 seconds ( RealVideo Clip; 0.6 Mb or MPG Video Clip: 24 Mb ). Both clips by Ken Glover. Journal Text: 170:29:33 4 minutes 07 seconds ( RealVideo Clip; 1.0 Mb or MPG Video Clip: 41 Mb ). Both clips by Ken Glover. Journal Text: 170:29:43 RealVideo Clip: (43 seconds) by Ken Glover. Journal Text: 170:29:44 MPEG Clip: (33 seconds; 4.3 MB) by Kipp Teague. The rover is parked at the VIP site behind the lunar module. 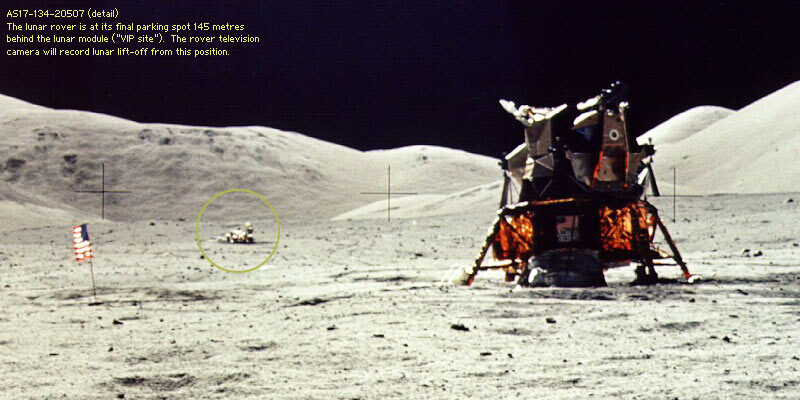 Jack emerges as a small figure, 145 meters away, to the right of the lunar module. He pleads with Gene to let him throw his geology hammer. 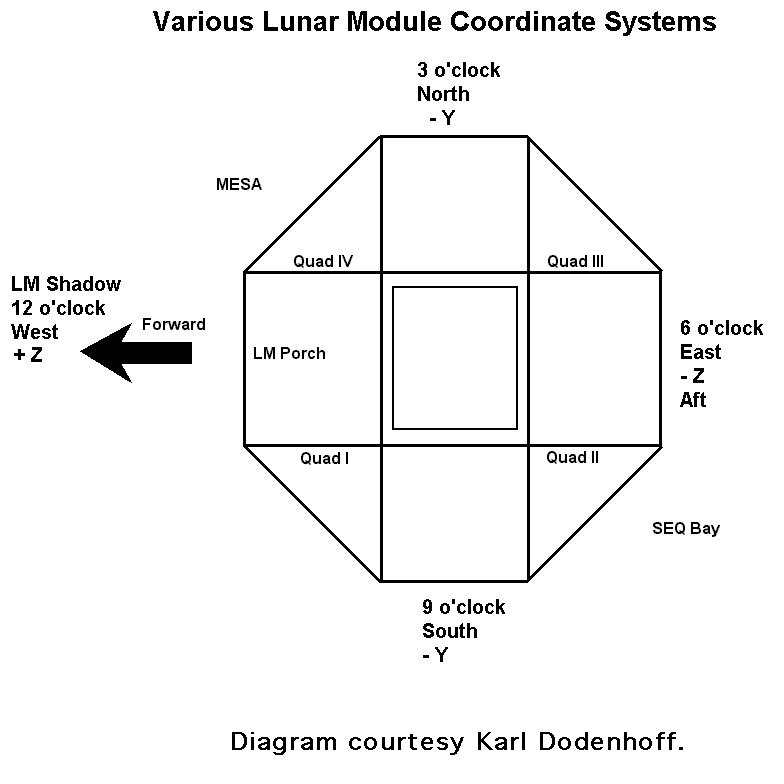 The commander concedes his permission and warns him not to hit the lunar module or the ALSEP. Jack flings it into the air and careful observation of the clip reveals the spinning hammer in flight, barely visible against the mountain in the background, and then against the black sky. Jack is thrilled with the long flight of the hammer and walks back to the lunar module. Journal Text: 170:33:35 3 minutes 36 seconds ( RealVideo Clip; 0.9 Mb or MPG Video Clip: 36 Mb ). Both clips by Ken Glover. Journal Text: 170:37:29 2 minutes 55 seconds ( RealVideo Clip; 0.7 Mb or MPG Video Clip: 29 Mb ). Both clips by Ken Glover. Journal Text: 170:39:59 3 minutes 36 seconds ( RealVideo Clip; 0.9 Mb or MPG Video Clip: 36 Mb ). Both clips by Ken Glover. Journal Text: 187:24:28 RealVideo Clip: (2 minutes 26 seconds) by Ken Glover. Journal Text: 187:24:38 RealVideo Clip: (4 minutes 24 seconds) by Ken Glover. Journal Text: 187:28:59 RealVideo Clip: (4 minutes 24 seconds) by Ken Glover. Journal Text: 187:33:14 RealVideo Clip: (3 minutes 7 seconds) by Ken Glover. Journal Text: 187:36:13 RealVideo Clip: (2 minutes 32 seconds) by Ken Glover. Journal Text: 187:38:44 RealVideo Clip: (3 minutes 18 seconds) by Ken Glover. Journal Text: 187:41:15 RealVideo Clip: (3 minutes 18 seconds) by Ken Glover. Journal Text: 187:44:24 RealVideo Clip: (3 minutes 41 seconds) by Ken Glover. Journal Text: 187:47:58 RealVideo Clip: (3 minutes 12 seconds) by Ken Glover. Journal Text: 187:51:01 RealVideo Clip: (2 minutes 52 seconds) by Ken Glover. Journal Text: 187:53:45 RealVideo Clip: (3 minutes 7 seconds) by Ken Glover. Journal Text: 187:56:49 RealVideo Clip: (3 minutes 47 seconds) by Ken Glover. Journal Text: 188:00:34 RealVideo Clip: (3 minutes 29 seconds) by Ken Glover. Journal Text: 188:01:27 MPEG Clip: (36 seconds; 4.7 MB) by Kipp Teague. Lunar lift-off film. (Freeze-frame picture series: a visual dissection of ignition and lift-off; 395KB) The television camera was mounted on the rover which Gene parked about 145 meters east of (behind) the lunar module. The ascent stage ignites and climbs, spacecraft foil and dust flying in all directions. Ed Fendell in Houston anticipates exactly the timing of ignition, lift-off, and the rate of climb, and the camera tilts to follows the ascent. At pitchover, the throat of the ascent engine points down at the camera and its combustion is visible as a small bright light. The clip ends as Challenger reaches an altitude of 1,500 feet. Journal Text: 188:01:30 QuickTime Clip: (16 seconds; 1.7 MB) by Gordon Roxburgh. This silent Challenger launch clip begins 3 seconds before ignition and follows the lunar module for the first 13 seconds of its ascent, until just after pitchover. Journal Text: 188:03:50 RealVideo Clip: (1 minute 43 seconds) by Ken Glover. Journal Text: 188:04:03 MPEG Clip: (34 seconds; 3.5 MB) by Kipp Teague. Post launch clip, 2½ minutes after ignition. The rover television camera pans across the moonscape showing the South Massif, the discarded lunar module descent stage with the SEP pallet resting against the plus-Y (north) landing strut, the flag (still standing), and the North Massif. The audio track carries the voices of Cernan, Schmitt, and capcom Gordon Fullerton. Gene announces they have climbed to 25,000 feet. Journal Text: 257:37:00 MPEG Clip: (1 minute 1 second; 6.3 MB) by Kipp Teague. Command module pilot Ron Evans spacewalks during the return to Earth, recorded by a 16mm sequence camera. He emerges from America's open hatch and pulls himself along the service module handholds to retrieve data and film cassettes (lunar sounder data, panoramic camera film, and mapping camera film) from the scientific instrument module (SIM) bay - experiments which operated in lunar orbit. He notes that paint on the service module is blistered and he can peel flakes off with his fingers.